It's been pretty chilly outside and with just getting over the flu, the girls and I have been doing some creating. Bug decided she needed a new pet bed for her littlest pet shop puppy, Pudge. 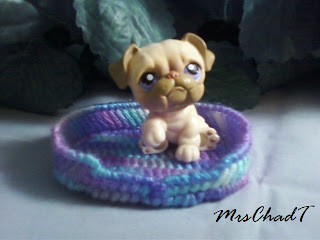 I came up with this plastic canvas littlest pet shop pet bed design and whipped it up. I'm thinking Pudge needs a blanket or a pillow for his bed, or maybe both. So we'll have to work on that this week. I'm working on a rug and toy for him to complete this set. What do you think, line the bed with felt?or fabric?